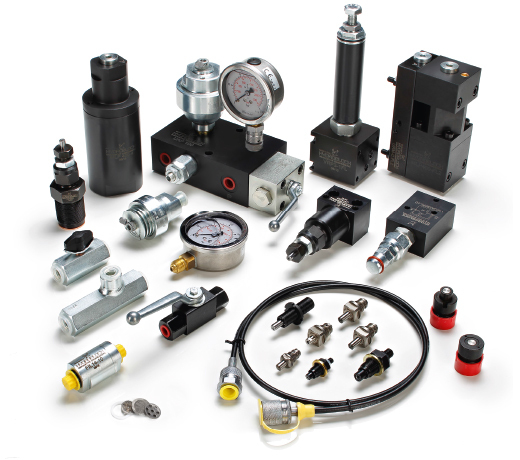 Rotary joints, hydraulic intensifiers, pressure reducing valves, sequence valves, check valves, flow control valves, air-oil booster units, hydraulic power units, coupling units, diaphragm accumulators, filters, integrated quick-action couplings, pressure gauges, etc. When the “P” port is pressurized with low pressure, the high pressure is available at “A” outlet port by the pilot check valve “X”. When the oil circuit has been filled, the pressure automatically increases: as soon as the pressure set at the sequence valve “S” is exceeded, the hydraulic intensifier works and increases the hydraulic pressure at “A” port. The sequence valve “S” have to : Outlet port – high pressure (secondary circuit) : Inlet port – low pressure (primary circuit) : Control (opening) of the pilot-operated check valve : G1/4” port for pressure controller or manometer for pressure monitoring be setted with pressure valve between 80-90% of the low inlet pressure. The URM450-FL2 and URM450-FL3 hydraulic intensifiers are equipped with an integrated pilot check valve that ensures a fast flow unloading of the high pressure and minimizes any counterpressure caused by inside check valves in line. Using this valve type a reduced constant outlet pressure can be obtained at the “A” port as compared to the higher pressure at the “P” port. The CP30F pressure monitoring cylinder has been developed to check the clamping pressure in a remote fixture. As soon as the clamping pressure is reached, the external bolt is extended by 3 mm from the cylinder head and remains in this position as long as the operating pressure required for the fixture is maintained. If the clamping pressure decreases, the rod is retracted again into its initial position. Thanks to the easy adjustment of the operating pressure by an adjusting screw at the cylinder and the availability of different pressure ranges, the CG30P stands out for unparalleled versatility. The CP30M pressure monitoring cylinder has been developed to check the clamping pressure in a remote fixture. As soon as the clamping pressure is reached, the external bolt is extended by 3 mm from the cylinder head and remains in this position as long as the operating pressure required for the fixture is maintained. If the clamping pressure decreases, the rod is retracted again into its initial position. Thanks to the easy adjustment of the operating pressure by an adjusting screw at the cylinder and the availability of different pressure ranges, the CG30P stands out for unparalleled versatility. The simple and compact VCS cartridge valve is especially designed to be incorporated into HYDROBLOCK cylinders. Combined with SR swing clamp cylinders it checks the position of the clamp arm. In addition, it is used for workpiece position monitoring in automated production processes. Upon request, the valve protection cartridge is available for the entire swing clamp cylinder series. With the CPV01 valve protection cartridge the final user can perform clamping operations without any workpiece being mounted in the fixture for a functional check or for cleaning purposes. In this case, there is no risk of damage to the VCS clamp arm position control valve caused by excess stroke. Using the unidirectional VRF18 flow control valve, the end user can set the swing speed of the clamp arm directly at the fixture and define the clamping sequence of the cylinders at the workpiece to be machined. This valve can exclusively be used for cylinders with flange connection and must be connected to the “A” clamping port. When the swing clamp cylinder is in unclamped state, the flow is free. Using the unidirectional VRF14 flow control valve, the end user can set the swing speed of the clamp arm directly at the fixture and define the clamping sequence of the cylinders at the workpiece to be machined. This valve can exclusively be used for cylinders with flange connection and must be connected to the “A” clamping port. When the swing clamp cylinder is in unclamped state, the flow is free. Manually operated pressure coupling unit for singleand double acting cylinders. This unit is used when the clamping equipment is separated from the hydraulic pressure generator, i.e. for manufacturing systems with pallet change or when a single pressure generator is used for several clamping devices. The precise execution of seats and slide ensure perfect tightness under pressure. These valves are designed for in-line mounting and can be installed in any position.